Disclaimer: I received one Kiwi Crate in the mail for review purposes. The opinions below are my own. Kiwi Crate Gifts is a monthly service for kids age 3-7 to receive a package in the mail full of stimulating themed crafts and information. I had heard a lot about Kiwi Crate, and when they contacted me to see if I'd like to do a review, I was excited to have the opportunity. The theme of the box we received centered around birds. 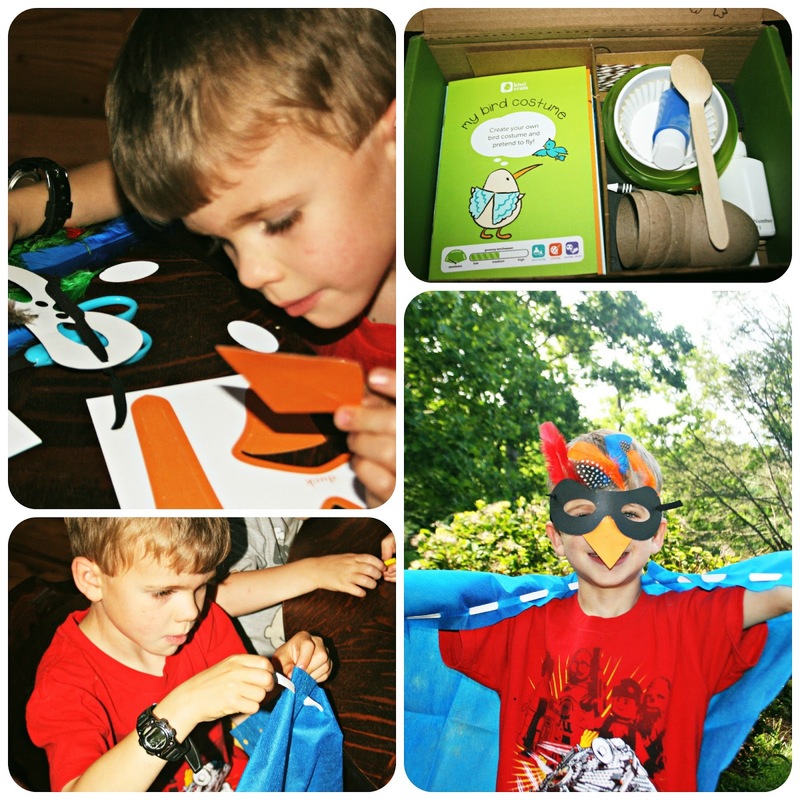 The box came with all the craft supplies needed to create an individualized bird mask and a pair of bird wings. In addition, it had informational coloring books that told about different types of birds and had ideas for games and supplemental learning activities. And as an extra bonus, the box even included a pair of children's Fiskars scissors (we are always losing our kiddie scissors, so I was thrilled to have an extra pair). Pierce set to work creating his mask and wings. One of the fun parts of the mask was that it had interchangeable beaks - a woodpecker beak, a kiwi beak, and a duck beak. Pierce decided to be a woodpecker first. Once his costume was completed, he flew around the yard and pecked at the wood on his playset. Next the 'woodpecker' created a nest of eggs. Pierce was able to do his crafts with minimal help from me - I only assisted with a couple of tricky glue dots and the tying of knots in the wings and mask. 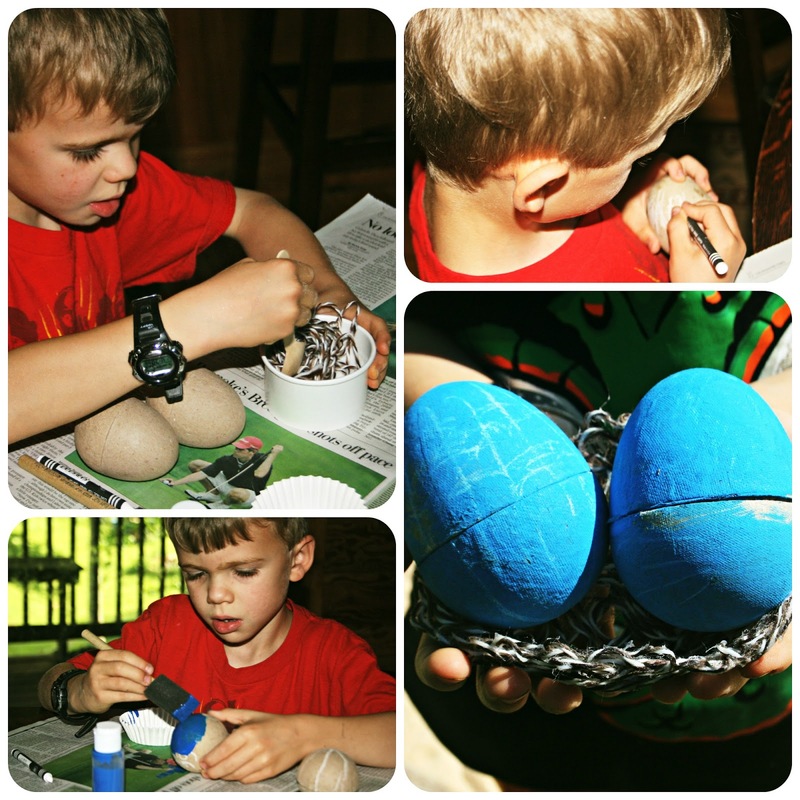 One thing Pierce loved about his finished bird nest was that the eggs crack open to hide treasures inside. Talk about some fun imaginative play! Kiwi Crate is one of the best kid-friendly products I have ever reviewed. It is unique, educational, and so much fun. If you have a grandchild or niece or nephew you'd love to send something special in the mail, this would make such a marvelous gift. A month runs $19.95 plus shipping, getting less expensive if you purchase several months at a time. You can also find them on Facebook. Readers, what was one of the favorite crafts or projects you remember making as a kid? Sounds like a cool concept, I'm sure kids love it! That is so cute! Do you have to suscribe like a magazine or can they be ordered one at a time? I'm going to have to go take a look. Bet the twins were jealous that Pierce got to do this and they didn't. The eggs are so neat! Kids love toys that open up for hiding things inside... heck, so do I ! I love that everything come in the kit. JDaniel loved their scissors! Reminds me when we would get our Weekly Reader books in the mail over the summer. Love the idea of keeping the kids occupied with something that also provides some education. We are waiting for our first Kiwi box to arrive. I am even more excited about getting it after reading your review! FYI, you can add siblings to subscription and they will add enough materials to the box that everyone can make the craft. Great idea and Pierce looks very interested and serious about his project. I remember taking craft lessons from my 3rd grade teacher...a favorite craft was a felt Christmas runner wall hanging. I have never heard of this place, but these crafts are enough to keep him occupied all day, and lots of things on the same theme. I LOVE the beautiful mask he made!!! Hi Lisa, sorry I've been MIA...things just aren't getting back to norm. Thanks for stopping by love hearing from you and the little ones! Take care..
What a great idea! Seems like a wonderful activity for Pierce! What a great idea and also a great creative activity! My activity was making WWII model airplanes from kits. Cute! I remember making friendship bracelets out of embroidery floss and shrinky dinks! Looks really wonderful! Lots of colour, and it encourages creativity. Gotta love that! This looks so fun! What a great idea. As a kid I really liked coloring. LOVE this and sure wish it had been around when my kids were little! Very cute, Pierce! I'm very impressed. I love the idea of getting something in the mail to work on. I bookmarked their website.